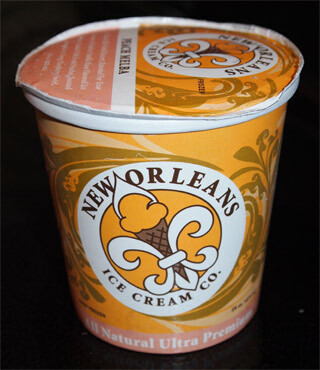 So with all the hub bub of wrapping up 2012 with the big holiday season, I forgot to finish up this post on the last two New Orleans ice cream flavors shipped to me last year. New Orleans ICC makes some epic flavors so you are probably thinking "Dubba, that's terrible of you to wait so long!" Well, you're right, but let's read the description on this first pint and then you'll understand. This is Cajun Rum Raisin and if you are like me, that Cajun part has you a little afraid. "Ragin' Cajun" is the first thing comes to my mind and I don't think my gut is that far off. 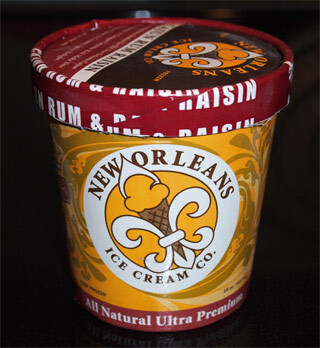 "Plump Raisins soaked in Old New Orleans Cajun Spice Rum & A Unique Cayenne Kick Make This Unique Flavor A Creamy, Spicy Delight". Wait, did they say Cayenne? Like as in the Pepper? Why yes, yes they did. In fact, you can see it as soon as you open the pint. Oh I am so immensely afraid..... ok, i'm not that afraid.... but I'm hesitant, very hesitant. Now the rum soaked raisins are ok, they don't seem to be burning or anything, but MAN OH MAN is the pepper in the base killing me. Even a small bite lights you up. Hey, I can admit I'm afraid of the heat. I tried to take a few more bites but oh my bloody word, this one is not meant for me, not even a little. Ice cream is meant to be a cold refreshing treat and I just don't know why you would want ice cream to burn? Oh, I get that some of you will love the heat and say give me more, but that's not how I roll. Sorry New Orleans but I can't eat this one. So, I decided to break out the other pint of New Orleans I had left. Now I meant to eat this one awhile ago (back when Adam reviewed it) but unfortunately I kind of lost it (yes, there were points in 2012 where pints would get lost in the freezer, but I've vowed to be better in 2013). So without further ado, let's wash that burning pepper taste out of my mouth. "A classic old world dessert, retooled for your freezer as peach & vanilla bean flavored ice cream, loaded with fresh peaches, toasted almonds & a tangy raspberry swirl".... and no, they aren't usually missing their lids like this, that was my fault. Don't even try to pretend that this one isn't epic looking ice cream. 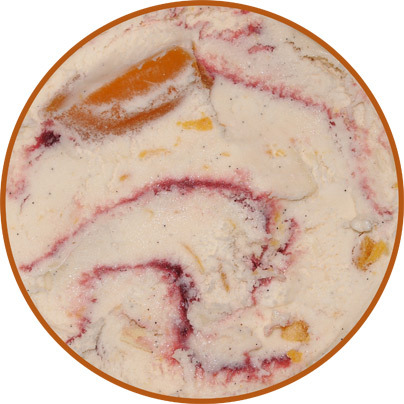 A huge peach chunk, abundant swirls, almond slices and check out all the flecks of vanilla bean. Oh I love those little flecks. Man, it's practically a work of art in my mind with all the wonderful colors here. Let me just stare for one more minute.... ok, I'm good, let's proceed. Well, there's definitely a nice mild peach flavor running through this pint, it's almost a peach whip cream flavor really. I'd be happy with just the peach flavor and the vanilla bean and be done with it, but there's oh so much more going on here. Is it a tangy swirl? I don't think that's the right word because it might scare people off. Flavorful works. I tried to scoop just the swirl but it's not really thick enough for that. With a bit of base and swirl on your spoon, it comes over as fairly strong and somewhat sweet, and definitely nothing you should fear. I have a question: why the almonds? At first they seemed to add nothing but thud. I got a ton on the first scooping but the second scooping is a lot more quiet which I'm appreciating. Hmmm, maybe a mild almond vibe is suppose to play off the peach flavor? I can kind of see the two being friends when you get an initial dash of peach and then follow that with the almond aftertaste. So we've got a nice summer flavor here. I think some of us are use to a typical simple peach flavor, but once again New Orleans goes full throttle to bring you a true taste of the city. Anyone can do peach, but who else is going to bring you Peach Melba like this? New Orleans ICC will never be accused of doing something half-hearted, that's for sure. If you ever see them on a store shelf, do yourself a favor and try whatever flavor catches your eye. The review of the Cajun Rum Raisin reminds me of how my parents swore off Outback Steakhouse years ago because "the food was too spicy." 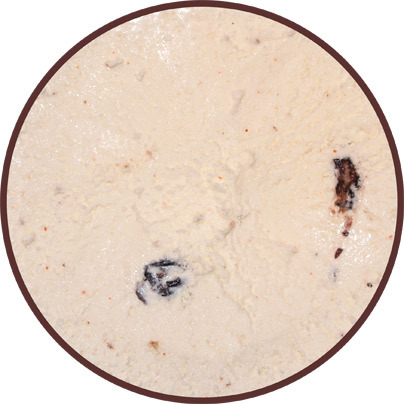 Tellingly, the Ice Cream Informant (who did not love this ice cream, by the way) describes the level of heat with the phrase: "the slight bite at the back of your throat thanks to the dash of cayenne." You don't have to like it, but please try to stay grounded in reality. Have you had this flavor? Just because one reviewer is bothered by the spice while the other isn't, that doesn't make either one of them more wrong then the other. The point of my review is make sure you know the potential for heat is there, factor in your own tolerance, and then decide if you want to pick this pint up or not. I think it's pretty clear that I do not like spicy (hot) foods. Also, there's over 700 reviews on this site, so I think "my reality" is doing just fine.